Until this session, I had never shot for another photographer. Sure, I have had couples where one of them enjoyed photography or fancied themselves a hobbyist. But never a legit, full time photographer with a beautiful portfolio and full time gig. There is something a little nerve racking about that, as all photographers can attest to I would think. Because when photographers watch other photographers, we are often judging. Any photographers that have gone to a wedding as a guest silently judge and critique and often sympathize with the hired photographer. Maybe even start to wonder what they look like when they are per se in character. 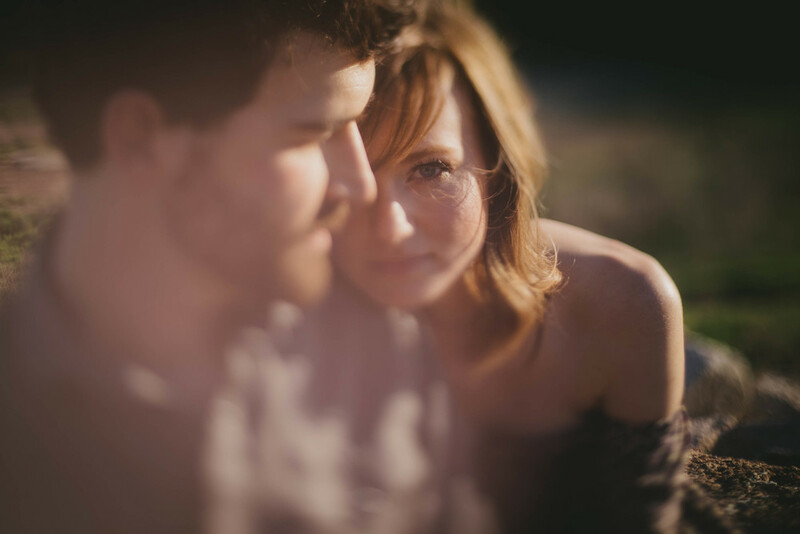 So when I asked Heather, and you should check out her work, after second shooting with me last fall if she and her husband, Trevor, would be interested in doing a moody engagement styled photography session with me around the Jordan Lake area, she was all too happy to join in. But asking a photographer to be in front of the camera is like, and since it's derby season, asking the horse to ride the jockey - it's just not natural. Heather and Trevor were beyond awesome to work with and what I realized is that the beauty of working with another photographer is that they know what you are doing and what you are going for when setting up for particular shots. So it was easy and I was able to focus in on getting creative. Beyond that, they were up for exploring, trudging through the brush, climbing debris and eventually being asked by the Park Ranger to leave the already closed for the day Jordan Lake recreational area where we may have technically been trespassing (though I do have to mention, when I asked the ranger for two more shots and he responded with "well...okay...because it looks like something important." What!?! Now tell me Rangers aren't amazing!). So we checked out several locations I had been cataloging in my mind. We chased the light until there was nothing left. And we made this body of work (and I may or may not have gotten poison ivy), and it was a blast! And thanks as always to the amazing folks at Indie Film Labs for the beautiful scans of some of the film we shot.